Ekuona family of Pakyi No. 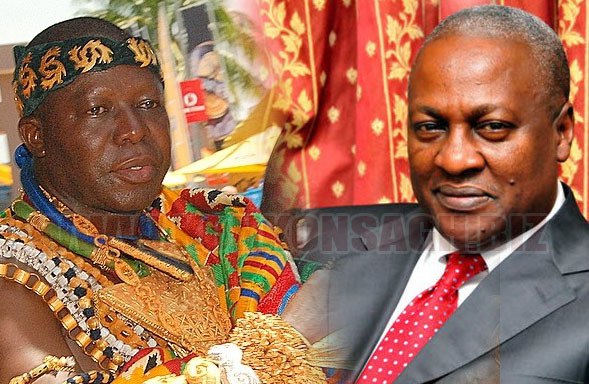 1 in the Amansie West District of the Ashanti Region have called on Asantehene, Otumfuo Osei Tutu II, to temper justice with mercy and reinstall Chief of Pakyi No 1, Nana Mensah Bonsu. The plea, according to the Ekuona family, would enable Nana Mensah Bonsu continue with his pursuit of his development agenda which he left behind since May 21, 2015 when he was destooled as Chief of Pakyi No1. Addressing a press conference at Pakyi, elders of Ekuona family in the persons of Nana Boakye Asare, Yaw Broni, Kwabena Amponsah, Justice Amankwa, A.K. Brobbey and Yaw Abrafi lamented that since the destoolment of Nana Mensah Bonsu, development projects in Pakyi No. 1 have come to a standstill. That development, they stressed, was making life unbearable and uncontrollable for many of the residents in the area. "We, the Ekuona family of Pakyi No. 1 have realised that our daughter and queenmother of Pakyi No. 1, Nana Akua Asantewaa Bonsu, were behind all the plots and false allegations against her 100% biological brother, in order to eliminate him for her 12-year-old son to become the Chief of Pakyi Number-One. The queenmother has brought division into the Ekuona family of Pakyi No. 1, and brutalising us and the community with well-built macho men. "...we want to set the record straight, that, there's no way we the Ekuona family can talk negatively about our own daughter and queenmother of Pakyi No. 1 in such a manner, but her activities are directly affecting everything, including developmental projects in the township," the elders asserted. They pointed out that it was one year now when Nana Mensah Bonsu's stool was turned, stating that all the projects initiated by Nana Mensah Bonsu have been halted, with no sign of continuity. The elders of Ekuona family mentioned that the main road that leads to the town, which was under construction by Nana Mensah Bonsu was now in a deplorable state. "Our biggest ICT centre in Amansie West District, built by Nana Mensah Bonsu with 15 sets of computers to fill the centre, has been abandoned, when the only thing left to make the facility ready for use was painting. "...the worse of it is the chief's palace which has been abandoned and given to wee smokers. The question we are asking is: where will we converge and plan good things about the town? the elders asked. They revealed that a three-unit classroom block for the Junior High School (JHS) which was about 90% complete has become a standstill. The elders chastised the queen mother of Pakyi No 1 for using her alleged macho men to harass the entire community. According to the elders, she doesn’t even recognise them, as her true family members who made her the queen mother by endorsing her. They stated that the queen mother on several occasions have tried to eliminate her own biological brother to make way for her 12-year-old son to become the Chief of Pakyi No. 1, an allegation the Queen mother has since described as complete lies and unfortunate. "We are only asking for his mercy as a father for all, and restore our hope by bringing back our chief. "We believe our cries would be heard and treated accordingly," the elders cried out.